Curious about what makes Sky & Slade tick? Slade graduated from the Canadian College of Massage and Hydrotherapy in Toronto with honours, focusing on sports, deep tissue, rehabilitation and prenatal massage. He also offers therapeutic ultrasound as an additional modality. He loves the reality that being a massage therapist doesn’t feel like work and the pure joy that comes from helping people is one that is cherished and honoured. He believes a balanced approach between fascial, deep tissue, trigger point, joint mobilization and Proprioceptive Neuromuscular Facilitation techniques is most effective. He also teaches partner yoga in the form of Acroyoga (yogaFLIGHT), through dynamic and therapeutic modalities that create connection, clear communication and trust. 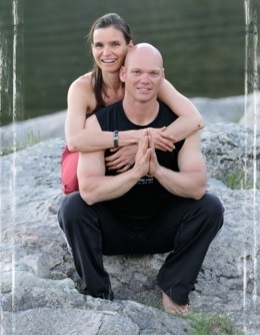 Both Sky and Slade have completed 200 hours of study and teaching through Trinity Yoga's Teacher Training certification program in Vancouver, BC and are Registered Yoga Teachers with Yoga Alliance. Sky has supplemented her Yoga Training with Yin, Adaptability and Mindfulness Certifications. Slade graduated from the Canadian College of Massage and Hydrotherapy in Toronto with honours, focusing on sports, rehabilitation and prenatal massage, and is a member of the CMTO in Good Standing. Sky graduated from Centennial College's Reflexology program and is a member of the RRCO in Good Standing. She has also been a Reiki Practitioner and Aromatherapist for 22+ years combined. In the summer of 2018, Sky walked almost 1000km on the Camino de Santiago. To say that the experience changed her life is an understatement. Her yearly goal is to continue walking and giving back on the Camino, both as a Pilgrim and a Hospitalera. Sky and Slade can turn your world upside-down in just a few minutes. You won't know which way is up and you won't care. My first yogaflight session left my body feeling 20 years younger... amazing. On the road, Sky and Slade live, laugh and love in their 34 foot Airstream, pursuing their dreams of flight and bringing the joys of yoga & yogaFLIGHT to people wanting to explore enhanced depths of play, loving kindness, trust, communication and community. Their mantra: yogaFLIGHT is for everybody and EVERY body.